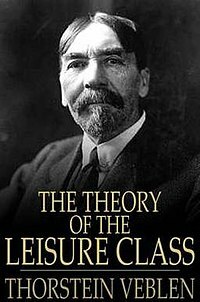 Considering the obvious preoccupation with analyzing the cultural assumptions of modern democratic capitalism displayed in this blog space, it’s perhaps surprising that I have not previously cracked the spine on the work of Thorstein Veblen, in particular his seminal 1899 book The Theory of the Leisure Class. Although I had some grounding in the basic outlines of his theory via references to it in the books of Andrew Potter, reading the original text itself was helpful in uniting the disparate threads of Veblen’s thoughts on consumption, competition, and class distinctions at the turn of the 20th century. For the academically uninitiated, Veblen’s dry, verbose prose, with its voluminous vocabulary and critical theory predilection for purposeful obtuseness of expression, can be a grand slog. It’s easy to miss not only the overarching arguments but especially their particulars, to say nothing of the many subtle barbs against his bourgeois Gilded Age targets of deconstructive analysis that are embedded in that analysis. Indeed, Veblen’s portentous writing is itself a marker of what he might call the invidious comparison of the sheltered class, an act of wasteful consumption that demonstrates his own insinuation into the processes of distinction. Even if Veblen holds himself above the fray with the feigned objectivity of the critic, he cannot wholly escape the implications of his all-encompassing social theory (especially in his final chapter on “the higher education”, a realm which the Yale-schooled theorist was clearly included in). That theory, for the unfamiliar, defies simple summation, but it must be attempted nonetheless. Veblen writes about the leisure class, generally understood as the vestigial aristocracy but ever-expanding by the late 19th century to include a significant portion of the rising middle class. This class is driven to consume commercial products and generally to behave and live in an ostentatious way, the display unconsciously establishing their relative level of wealth and comfort in comparison with that of their fellow citizens. Veblen conceives of this habit as being an instinctual social survival from earlier structures of culture, in particular what he calls the “barbarian stage” in which a prestigious hunter-warrior elite ruled over and above their tribal inferiors by virtue of their prowess with physical violence. If the upper class of Veblen’s time does not precisely subsist on a diet of violence, their relations towards their fellow men, especially in the growing business sphere of the time, are understood as being essentially predatory in nature, and those displaying predatory traits are more likely to survive (social Darwinian ideas are key to Veblen’s views). However, the true method of distinction for this class is, as the name implies, their leisure, (ie. assumed abstention from manual labour), thus rendering the predatory instincts essentially vestigial. With this rationale in mind, a spiral of consumption ensues; the products used and displayed and the activities engaged in by the leisure class are chosen based on established canons of taste, and those canons select those objects of consumption that most clearly signal the consumer’s abstention from the menial undertakings of the working and artisan classes. These unwritten rules apply first and foremost to the male heads of household, in a pecuniary confirmation of the imperatives of the patriarchal system. But they extend to servants, children, and particularly women, who act as vicarious actors whose unproductive consumption and conspicuous waste serves to reaffirm the class prestige of their master (Veblen would have had a few belly-laughs at The Queen of Versailles, all while thinking how little things have really changed since his day). These invidious comparisons are drawn out by Veblen in multiple aspects of the culture, from business and education to sports, politics, gambling, and even religious belief. What emerges is a point-by-point dissection of the collective psychology of contemporary leisure-class consumption, a model that is variantly applicable even in our own culturally-saturated time. To a large extent, Veblen’s ideas have become so self-evident as to have been internalized, particularly in the anti-capitalist movements of the modern Left. A work like Chuck Palahniuk’s Fight Club (“you are not what you own”) is only the most obvious response to the phenomenon that Veblen registers in The Theory of the Leisure Class, but the effects of the system described penetrate even the most outward acts of anti-consumption resistance. Like many ideas that have become part of collective cultural knowledge, one way or another, the valences of Veblen’s theories can easily be lost in the fog of their assumed ubiquity. Even common knowledge requires occasional restatement, and it was instructive to experience that restatement via the author himself in his book. A reading of Veblen is also rather instructive to understand his theory’s limits, as well as the discriminatory assumptions that underlie it. The extent to which the theory of the leisure class holds true in our own time can obscure the troubling truth that Veblen’s thoughts on these matters were built up from and sometimes hindered by the dominant assumptions of his historical intellectual milieu. I mentioned his social Darwinism, and though it never leads him to the darker ends of that particular belief-system (eugenics, ethnic cleansing, etc. ), it colours his ideas in pernicious ways (witness the quasi-Aryan references to the inherent predilections of “the dolicho-blond race”). It is soon enough realized by the astute reader that Veblen considers entire socioeconomic classes to have been evolved into their present state, an assumption true of not only the leisure and working class but also what he calls “the delinquent class”, a body of the poor and the dissolute prone to crime and vice whose motivation are put down to genetics more than to their deprived circumstances. Most unforgivably, Veblen constructs a theoretical framework that serves to sharply critique the patriarchal system and the marginalization and objectification of women, but then smacks down the contemporary women’s suffrage movement with a smug chauvinist stroke, implying that it can be seen as “unfeminine”. His ideas hint at potential feminist solidarity, but he himself is a prisoner of the discriminatory postulations of his culture and cannot always follow his theories to their obvious conclusions because of it. This moment is the strongest of many reminders in The Theory of the Leisure Class that no matter how much insight a given theoretical framework can offer us on the conditions of our current society and culture, they are always already products of their historical context and therefore subject to the limitations and deprivations of that context.